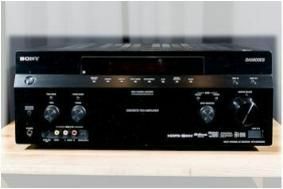 BRISTOL SHOW 2011: Sony shows off flagship STR-DA5600ES 3D receiver | What Hi-Fi? He's been working on a new flagship 7.1 multichannel receiver, the £2000 STR-DA5600ES which is star of the Sony stand, alongside the company's VPL-VW90ES 3D projector. It's the successor to the previous STR-DA5500ES and DA5400ES models, and one of a range of new multichannel receiver products due from Sony this year. Eric reckons the 'DA5600ES has "the best audio tuning to date", and it's equipped with 7x100W amplification, automatic phase matching, speaker relocation technology, internet radio and Faroudja processing. Additional highlights include the full suite of HD audio decoding, internet connectivity via four ethernet ports, DLNA compatibility, Dolby Pro-Logic IIz and the option of adding additional front height speakers. There's no Apple AirPlay compatibility at this stage, but Sony says it's watching the development of AirPlay "very closely" and if the consumer demand is there, our guess is an upgrade may follow. Further details in our earlier news story. We hope to get a review sample of the STR-DA5600ES just as soon as we can prise one out of Eric! Sony has also told us that it's "looking to launch" its new flagship BDP-S780 Blu-ray player in the UK later this year. We'll bring you more news just as soon as we have it.